Sorry for the rough sketch, but I seem to be unable to draw anything else these days. Anyway, here are the people Niels is up against. Don’t they strike fear in your heart!? Some people wanted the heroes to be even worse than Niels, but I always intended for Niels to be the bad guy, so I wanted his opponents to be likable. Now I just have to hope that you won't like them so much that you want to see Niels dead. Thomas is a detective/cop, who was originally interested in “Johnny” and followed every little step he took, even though it wasn’t his case. He did however know the old policeman who had to deal with Johnny, and who, to be frank, didn’t care much for that job. There was no way of catching Johnny, so he let Thomas have his fun. Then one day Johnny just disappeared, and suddenly Thomas started seeing Niels all over the place. Sure, Niels had been there for a long time, but now it seemed like Niels had taken over business. The old cop just waved it off, saying Johnny was probably just hiding from someone somewhere, but Thomas didn’t buy that. He had seen nothing that indicated that Johnny suddenly had reason to hide, so Thomas started following Niels instead, wanting to know the truth. Then the old cop retired and Thomas begged to get his case. He got it, and the wild chase for Niels started. Thomas became obsessed. He started to seriously neglect his wife, and only barely managed to reach the hospital in time to see his daughter, Wendy, be born. It had been a difficult birth, but the little girl was healthy. He forgot all about Niels and ran back through the cellars, but realized that he had been so caught up in the chase that he had no idea where he was. He spent far too long trying to get out, and when he finally reached the hospital, his wife was dead. The complications from the birth had killed her. All fight and obsession left him. All hopes died. Non of that meant anything anymore because he hadn’t been by his wife’s side, and now had to raise his daughter all alone. He no longer had any desire to catch Niels, and he convinced himself that it was impossible. Now he just wanted to spend as much time with Wendy as possible. His boss noticed that Thomas didn’t get a whole lot of work done, and decided that he needed someone to help him. Therefore Caron was made his partner. She had wanted to be on the Niels case for a long time, and was impressed by the things she had heard about Thomas’ work. She knew he didn’t care much for the whole thing anymore, but was convinced that she could get him going again. Caron is still working on sparking Thomas’ interest for the case, while Thomas just want to be left alone and spends a lot of time trying to convince Caron that it’s hopeless. 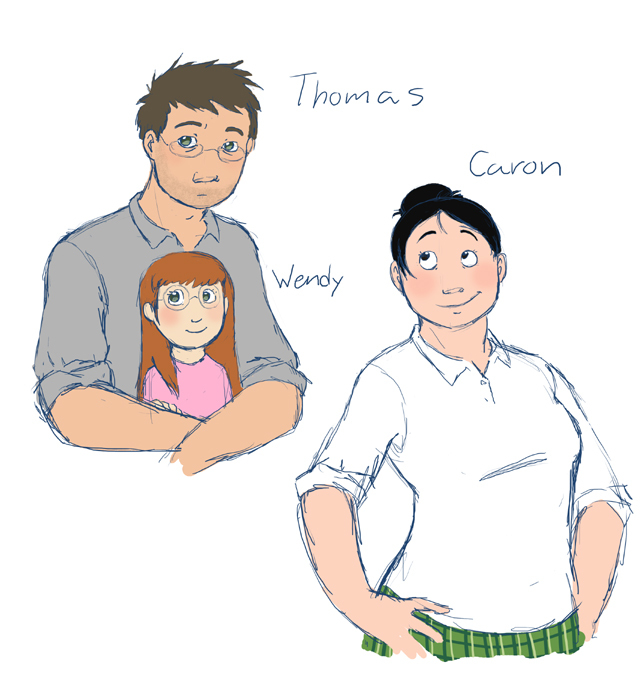 Their (mainly Thomas’ so far) backstory is still a bit sketchy, but hopefully you get the idea.